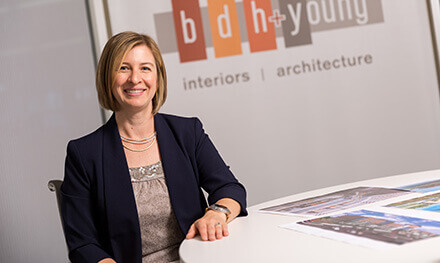 Bdh+young Partner Megan Duffy Sananikone is being recognized by the International Interior Design Association (IIDA) and the Cystic Fibrosis Foundation for her leadership and design excellence. Megan was recently elected to serve as Executive Adviser to the IIDA Northland Chapter Board of Directors. Megan is passionate about providing relevant and meaningful support to commercial and interior design professionals and has served three separate terms on the IIDA Board. In her current role as the Adviser to the IIDA Board of Directors, which started July 1, Megan is responsible for analyzing market research as it relates to the organization’s mission and values. In addition to serving on the IIDA Board, Megan was also recognized as a Twin Cities Finest Honoree by the Cystic Fibrosis Foundation. The selected individuals are outstanding professionals working to raise awareness and funds to support the Cystic Fibrosis Foundation. Megan’s goal is to fund research and drug development by raising $7,500 in support of everyone affected by Cystic Fibrosis. Visit Megan’s fundraising page to donate and track her progress.